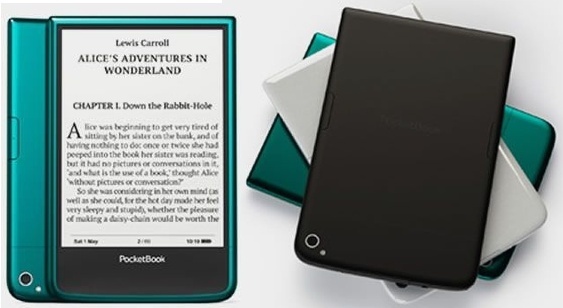 The Pocketbook 650 Ultra is one of the more anticipated ereaders to launch this year, but it is still hard to come by. I myself an still working to get my hands on one of these camera-equipped ebook readers, and until I do I will have to be content with hands on videos like the following. A Russian blog by the name of MegaObzor bought a Pocketbook 650 and posted a video earlier this week (found via AlleseBook.de). The video is narrated in Russian and I would guess that it includes a lot of detail concerning the build quality and features. Since I don't speak Russian that doesn't help me, but late in the video we get to see the Ultra in action. The reviewer shows the camera in operation, and he also demos the page turn. The Pocketbook 650 Ultra is equipped with a 5MP rear-facing camera with LED flash, and as you can see in the video it can be used to take a photo of text. Ideally you are supposed to convert the image into text, but the reviewer mentions in his post that it was difficult to get the camera to focus properly. I don't have any other reports to support or deny that, but if it is true then the one reason to buy the Ultra may have just evaporated. The Pocketbook 650 Ultra is available now in Russia, where it retails for 8990 rubles. It's currently being launched in Europe, but I can't confirm that retailers are already carrying it. This ereader has a 6" Carta E-ink screen, and it runs Pocketbook's own reading software on a 1GHz CPU with 512MB RAM, 4GB internal storage, and a microSD card slot. In addition to the camera, the Ultra also has Wifi, a touchscreen, and a frontlight. it supports a broad selection of ebook formats, and includes a number of software features including Dropbox integration, a Pocketbook-focused sync service, and more. About the camera test in the video. A plain surface to put that paper on sure would have helped to get a better result. That red cloth had big wrinkles, no wonder the result looked uneven. Also, Pocketbook already offers an update for the 650, the scanning feature might be improved.